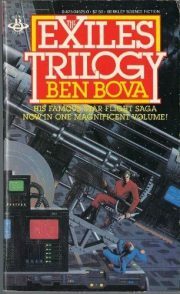 1971’s Exiled From Earth, 1972’s Flight of Exiles, and 1975’s End of Exile form Ben Bova’s Exile Trilogy. 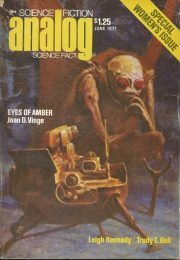 Cast out from overcrowded Earth, will our heroes be able to maintain a stable culture for the decades or centuries it will take to find a new Earth … or will they, like pretty much every other generation ship in the genre — last week’s excepted — end up recapitulating Robert Heinlein’s Orphans of the Sky? 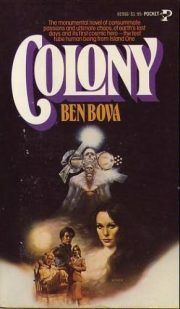 1978’s Colony is a sequel of sorts to Bova’s earlier Millennium. Chet Kinsman’s sacrifice in Millennium was not entirely in vain; the Cold War is over and in 2008, the Earth is governed by a World Government directed by the well-meaning socialist De Paolo. Unfortunately the essential issues—overpopulation, and the pollution and resource depletion that accompany it—that drove the United States and the Soviet Union to contemplate nuclear war didn’t vanish with the Cold War. The weak World Government can manage little beyond palliative measures. Doomsday has been delayed, not prevented. And there are those who are doing their best to push the world towards its final crisis as quickly as they can.